The Yoast WordPress SEO Plugin Noindex Date Archives Tutorial article is part of a series of SEO tutorials to support the Stallion WordPress SEO Plugin and the Stallion Responsive WordPress SEO Theme. 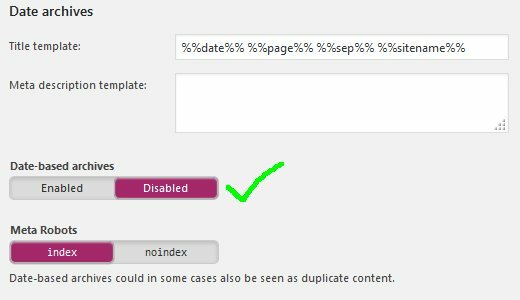 Can also be used by Yoast WordPress SEO Plugin users to check if they have set any damaging Yoast Noindex robots meta tag options. This WordPress SEO tutorial covers the Stallion WordPress SEO Plugin – Yoast WordPress SEO Plugin Noindex Date Archives Warning and the Stallion Responsive Theme – Yoast WordPress SEO Plugin Noindex Date Archives Warning. Return to the main Yoast WordPress SEO Plugin Warnings article or the main Stallion WordPress SEO Plugin Documentation article. You have a serious search engine indexing issue on your WordPress site regarding your WordPress Date Archives. While you have this SEO warning, the Yoast WordPress SEO Plugin is stopping all search engines from indexing your WordPress Date Archives!!! The noindex robots meta tag stops the webpage from being indexed in Google etc…, as long as this option is set none of your WordPress Date Archives will be found for relevant searches in any search engines including Google! Although the noindex robots meta tag doesn’t stop the link benefit (PageRank : PR) from flowing through the Date Archives to the WordPress Posts (Posts will still be indexed and gain link benefit via the Date Archives links), the link benefit spent on indexing the date archives (~15% of the link benefit flowing into the date archives) is wasted! When noindex is set the ~15% of link benefit that would normally be used to rank the Date Archives for relevant SERPs does nothing, it’s wasted! The Stallion WordPress SEO Plugin under the Not Index tab there’s a similar Block All Date Archives** option that’s highlighted in green. The Stallion WordPress SEO Not Index feature uses canonical URLs (instead of notindex robots meta tags) to recover most (doesn’t recover it all) of the links benefit that would be wasted from using the Yoast WordPress SEO Noindex Date Archives option. The first SEO question is, do any of the WordPress date archives hold SEO value? The quick answer is a big NO. The dated archives are awful SEO wise, the only SEO value they hold is it’s another way for Google etc… to find the WordPress Posts (a dated HTML sitemap), BUT the SEO cost to keep them indexed and the SEO damage from the targeted anchor text (the links to the archives) isn’t worth it for a sitemap! Everything about dated archives is SEO damaging. To index any webpage costs link benefit, in a perfect SEO world EVERY webpage on a WordPress site would serve an SEO purpose (generate Google traffic directly) and/or serve a user purpose (a contact page for example, no SEO value, but very useful to visitors). Spending valuable link benefit (PageRank : PR) on indexing dated archives is stupid : NEVER use any of the WordPress Dated Archive Widgets. Dated Archive title tags are awful – tend to use dates, months, years etc… which have no SEO value. 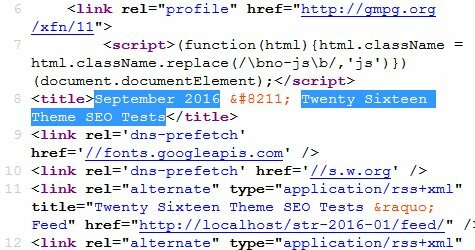 The above is a screenshot of a dated archive (September 2016) view source (viewing the HTML source in FireFox) for a test site (site name: “Twenty Sixteen Theme SEO Tests”) using the Twenty Sixteen theme and no SEO plugins. The title tag output is “Month Year – Site Title” which is awful, there’s nothing to work with. Dated Archive internal links anchor text is awful – tend to use dates, months, years etc… which have no SEO value. Again Twenty Sixteen theme output for the calendar (daily archives) widget and the dated (monthly archives) widget, the calendar widget uses the day of the month (1, 2, 3…. 30, 31) and the monthly archives widget uses “Month Year” as link anchor text. They are SEO awful, those will be SEO damaging to the SEO content targeting of Posts etc… they would only benefit content covering months, years and the number 1-31. Dated Archive SERPs targeting is awful – title tags and link anchor text tend to be dates, but the content is everything from the site (no targeting at all, no categorization). 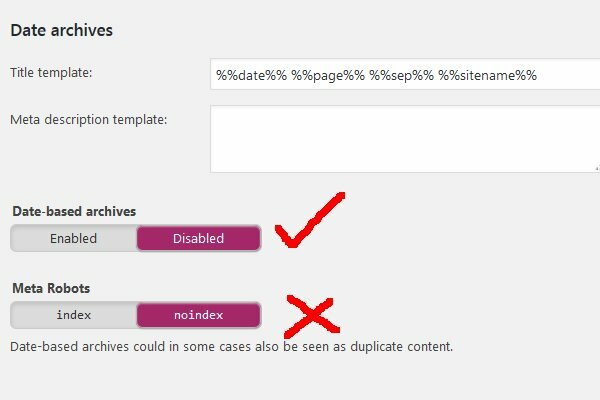 If you care about your WordPress sites SEO do NOT use the Archive Widgets (Calendar and Archives) or any theme/plugin custom Archive widgets. If you currently have Dated Archive widgets on a sidebar go to “Appearance” > “Widgets”, find the relevant archive widgets and remove them. While you are editing your widgets, seriously consider removing the Meta Widget as well, it’s a waste of link benefit to link to your WordPress Login Page: see Alternative Ways to Login to WordPress. In brief, no, never add a noindex robots meta tag to dated archives, this wastes link benefit. If you follow best SEO practices and remove the Archive Widgets from your WordPress site there shouldn’t be any internal links to your Dated Archives (this is good), over time Google will slowly deindex any that aren’t linked to (can take months, there’s no rush). The best SEO option is setup 301 redirects to redirect link benefit/ranking (recovers ~85% of the link benefit) from the dated archives to the sites Home Page. 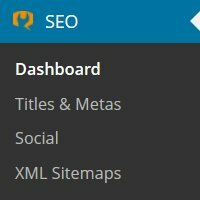 There currently isn’t a Stallion WordPress SEO Plugin 301 redirect option, but the Not Index option (“Block All Dated Archives” which uses canonical URLs : a soft 301 redirect) recovers the same amount of link benefit (~85%), but doesn’t ‘physically’ redirect the user to the Home Page (the 301 redirect option is better since it redirects the user). If you believe your visitors like the dated archives take a look through your weblogs, do they regularly use the dated archives, are visitors clicking through them looking for relevant content??? Probably not. If you still want to keep the Dated Archives, accept they cause SEO damage (a LOT of SEO damage) and this could have an impact on your Posts rankings! You can not improve the SEO of the actually date archive webpages (what you see in a browser like FireFox, Chrome…), but you can minimize the SEO damage to most of your WordPress site, but it isn’t default WordPress behavior. For example in the Stallion Responsive theme the SEO damage from the dated archive widgets could be minimized by using the Stallion Display Widgets feature. The Stallion Display Widgets feature sets which sections of a site a particular widget should be shown on (it’s a silo SEO theme feature). If you must use the Dated Archive Widgets please use the Stallion Display Widgets options set under “Stallion Theme” > “Layout Options” : “Widget Display ON”. When the Stallion Responsive Display Widgets Option is ON, most widgets have a new set of options (under “Appearance” > “Widgets”). The above two options work together, the first option determines if the next option is Show or Hide (it’s set to Show). The second option sets which parts of categories and single Posts (your WordPress Posts) this widget is shown or hidden on. It’s set to Show on Page 1 (of Categories) but not (that’s the – minus sign) show on of single Posts. Together the options say load this widget on the first page of categories, don’t load on single Posts at all. The form box below has another set of options (a lot of options), can set other locations to show/hide the widget. Together they mean show on the static front page and show on the first page of home page archives: basically no matter what your homepage settings the home page loads the widget. This option says show on single Posts of the categories selected in the box below, if you don’t select any categories, the widget isn’t loaded on any categories or single posts. Load on home page/front page and archives first page only, won’t load on Single Posts or Static Pages.